We Design and Build garden landscapes that stand out and are far from dull and dreary. Our goal is to have you happy with your garden space when were done. 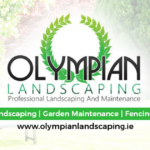 Olympian Landscaping also provides Garden Maintenance and Tree Surgery services.